Wine People Problems | "We are all mortal until the first kiss and the second glass of wine." Wine People Problems – "We are all mortal until the first kiss and the second glass of wine." "We are all mortal until the first kiss and the second glass of wine." So the other day I am cruising Instagram (my social media interaction of choice) and I see a meme that’s been going around awhile; a quote the people have come to believe – it says “Wine is a grocery, Not A Luxury”. And I die a little inside. And I cannot believe how much I am bothered by this. I mean you can buy wine at a grocery store. Hell, you can buy wine at 7/11. 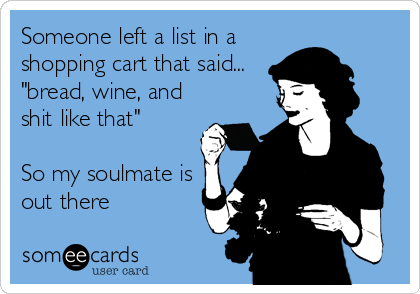 But no – I insist – wine is NOT a grocery. Grapes are a grocery. Grape Juice is a grocery. Vinegar is a grocery. But wine – wine is so much more. Maybe wine is an accessible luxury. Maybe we can throw the word luxury out all together – it makes it sound like a Louis Vitton bag – as if it is only for the elite and those who like to blow all their tax refund on a single vice. But still, wine is so much more. Have you ever met a winemaker? Have you heard them passionately talk about the heart and soul they put in to the product you are purchasing, drinking, aging, gifting? Then you know wine is MORE than a grocery. You know wine is an art. You know the number of hands that have touched your wine – viticulturists. farmers, winemakers – the travel it has take – from earth to barrel to bottle to you – YOU KNOW this is something more special than any grocery. If you have ever step foot in wine country and met those beautiful hippies who have dedicated their lives to making sure what you consume is special, valuable, worthy of an experience worth traveling to see how it is done, then you know wine is more than a grocery. Now I am certain this whole “Wine is a grocery” slogan came from the wine industry itself in hopes you would pick a bottle up at the grocery store. They hoped you would include wine in your weekly grocery budget. They hoped you would think “Wine is for everyone” and that message IS right. But in the way that EVERYBODY deserved the luxury of wine; not as a marketing tool but as a way to treat yourself. As an adult I spent many years many miles and states away from my family for pretty much every major and minor holiday. Since moving back to my home town about a year ago I have made up for lost time by spending holidays, weekends, evenings after work – every opportunity I have – catching up for lost time. A top priority has been my secretly elderly grandmother. I say secretly because although she has surpassed the age of 90 she still is never caught without high heels on, hair done and very fashion forward outfits and accessories. She’s never been a traditional grandmother in the sense that she was rarely in the kitchen unless it was to make a drink, she went salsa dancing every Friday through her late 70s, and her favorite grandmother/granddaughter bonding involved long hours at the mall. If she weren’t 4’11” and size 5 shoes – her closet would have been what I was raiding in my high school years. Instead I was stuck stealing my sister’s clothes (Sorry, sis!). I have a lot of memories of growing up with her as a favorite mentor. Playing dress up at her house when I was 10 and actually the same size as her is a highlight. I remember her saving the best parts of the rotisserie chicken she brought home for dinner for her dog. I remember her threatening us with any object within reach if we didn’t behave – her high heel, the broom, the fly swatter. And I remember her never following through… at least with me (Sorry again, sis. And naughty cousins). I remember trying on her lipstick and spritzing her Chanel no 5 on my neck (she probably should have more than threatened me at this point). And I remember Mother’s Day when I was around 9 years old. She and I were out with my mom and sister for a girls’ lunch. The second my sister and mom walked away to use the restroom my grandmother pushed her wine glass in front of me. I am sure I looked at her like she was crazy because she laughed. Now my grandma may have seen this as European and cool… but she was also smart enough to know my mom wouldn’t agree. I took a quick swig and tried not to make a face as my mom returned with my sister. This was the first sip. I don’t know if it was good; not likely as it was just the house wine at a place holding Mother’s Day brunch. I do remember it was red. And I remember my grandmother winking at me with her long, fake eyelashes when my mom asked her if she was enjoying her wine. Our secret. I don’t know if she did the same with my sister or my cousins when I wasn’t around; if she did we were all pretty good at keeping the secret from even each other. Now I realize this isn’t much of a story – just a brief memory from childhood. The first sip of thousands and many more to come. But to me, that day, that secret, are the basis of a close adult friendship I’ve come to have with my grandmother. The first of secrets we’ve kept, gossip we’ve shared. More than 20 years later and I still love to share a glass of wine with her and talk about our lives. At 90+ years she’s lived 3 times longer than me and has the stories to prove it. She’s shared wine with incredible people of the past; she’s had wine made from grapes grown on vines long ago replaced and vintages from before I was ever born; but today, her favorite person to open a bottle of wine with is me. Yeah – I know. I’ve been a slacker. More to come, I promise! – My 4 year old nephew disagreeing when I suggest an alternative to milk and cookies for Santa. Sorry, Sis! I tried! I experienced the ultimate tasting yesterday; a FOUR HOUR CHAMPAGNE (and other sparkling) tasting. I have done tons of wine tastings in my years as a Wine Person but I truly believe when you add bubbles, it gets extra interesting and the fact that there are 5 types of Wine People at a wine tasting becomes obvious quickly. I am going to go ahead and get “The Expert” out of the way. S/he is at every single tasting no matter the cost, no matter the product, they are ALWAYS there to taunt the Wine People doing the pouring. They start out by doing the very intense tasting: they hold it up to the light and then back down to the paper with the pricing, swirl so hard you’re not sure how they haven’t spilled it everywhere and by the time they settle down, all the bubbles in the champagne have disappeared. Next they do the gurgling, air sucking thing (which I understand is proper protocol) and then sloppily spit into the bucket being shared by the entire group of 100 people who have paid to be there. A bit of it splashes into his/her face but s/he seems not to even notice. Now, Wine “Expert” realizes s/he has some questions. “Is this authentic Champagne?” At this point Wine Person Pouring thinks s/he’s gotten off easy; that perhaps this is just a normal Wine Person asking the usual questions and is happy to confirm, this is, indeed, real Champagne from France. Don’t worry Wine Person Pouring, Wine “Expert” is NOT done. Thank you, Wine “Expert” – we are sure that following your questions and condescending commentary you are more capable of rating the products than those at respected wine publications. Why don’t we just take your palate for fact, discount that others at this very large gathering have enjoyed it or may enjoy it, and dump the rest down the drain. You, Wine “Expert”, truly are the only thorn in the side of a very fun event, so instead we will all move on and continue enjoying ourselves. Okay, this is much more Wine People than Person because the Happy Hour-ers travel in packs. They don’t believe in spit buckets, they don’t believe in maximum 2 oz pours, and they don’t believe how lucky it is that $20 just bought them 4 hours of drinks. The Happy Hour group are like the high school cool table – even though they’re in the exact same place doing the exact same thing, they are having more fun than every one else. They’re laughing and dancing and taking selfies and are becoming new BFFs with whichever Wine Person Pouring has their new favorite in an attempt to get infinite refills throughout the next 3.5 hours. As for whether the Happy Hour Group will actually buy anything – probably not. In my experience only about 25% of the time will they consume so much that they actually turn around and buy a case or 2 of their new favorite but usually they just get an Uber and head home. This one is hands down the Wine Person Pouring’s FAVORITE attendee. They are legitimately there to find new wines to love and will buy anywhere from a few bottles to a few cases of wine. The Wine Purchaser is knowledgeable but not condescending. Some Wine Purchasers are looking to collect (buying big $$ bottles) and others are looking for daily drinking (meaning many bottles). Regardless, The Wine Purchaser is the reason these events are suppose to exist, the reason the Wine Person Pouring has a job, and unfortunately are usually only about 5% of the group. Regardless, without them these events would seize to exist so if you’re not one of them, thank one. Wine Person Pouring: Can I offer you a complimentary taste of wine? Passerby: Let me tell you this tragic story of a drunk driving accident/alcohol poisoned friend/abusive alcoholic person I once knew. … Thanks for the fun sucking. A simple “No, thank you” would have sufficed. But I’ve found those Storytellers are strictly at free events. As for paid events, I LOVE the Storytellers and I can listen to them all day. Their stories are about having traveled the world, seeing Bordeaux and Champagne, Tuscany and Umbria. The Storyteller has met some of the world’s top winemakers and Sommeliers. Although their stories may include some facts and information, the stories are mostly the root of wine – romance. You can see their memories coming out of them with a smile on their face while they imagine the scenes they are trying to describe to you. The Storyteller makes me want to drop everything and travel the world trying all the wine just to return in a non-specific amount of years and eventually become a Storyteller myself. I aspire to be you, Storyteller. So I actually cannot dump on The Drunk. The Drunk usually starts out as one of the above Wine People but due to intoxication – things begin to escalate quickly. The drop of a wine glass, the knocking over of a wine bottle, the hugging of friends and strangers, and proclamation of their love of every wine they try. As long as it stays innocent enough it’s pretty humorous. They like to toast with each 2 oz pour, “To my ex-husband, who would have never joined me at anything this fun!” or “To you, Wine Person Pouring, without whom I would not have 2 oz of wine in my glass!”. 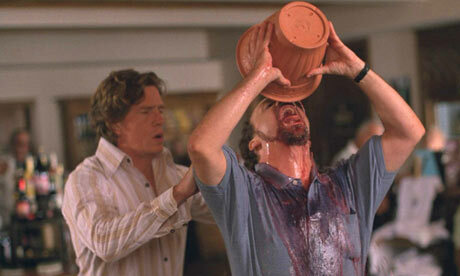 As long as The Drunk avoids falling over or going all Miles (Paul Giamatti) in Sideways and chugging the dump bucket, s/he is like the live entertainment at any wine tasting. Can you think of any other kinds of Wine People at Wine Tastings? Which category do you most fall into? I never met a Brut I didn’t like!